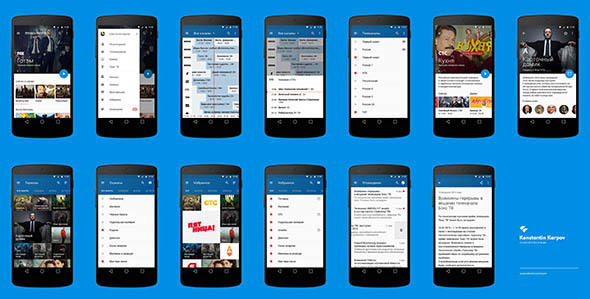 Material Design is a design language developed by Google. It accentuates the use of animations, shadows, bright colors and typography in order to permit users to rapidly understand the interface and provide them an awesome user experience. Material web design brings uniformity to all Google UI elements and is a comprehensive guide for visual, motion, and interaction design across platforms and devices. Material Design is a sensory expression of Google’s brand and it is getting more and more popular in the graphic and web design world. In this post, we gathered a collection of 20 free material design PSD elements that will certainly help you create gorgeous Material Design projects. You will find user interface kits, icon sets, app designs, templates and many more free Material Design PSD elements, in the list below. 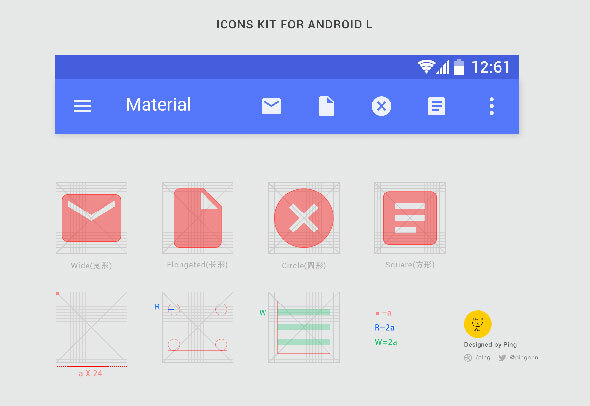 Every feature on this Android L GUI KIT is vectorized. It includes some smart objects that allow you to open screen designs. This is an awesome freebie that you can keep in your design inventory and that might come in handy for your next Android project. This is a free limited set of incredible components and templates. It works with Adobe CS6 and comes with over 40 UI elements, 40+ templates, and 7 application categories. You can use all these awesome options to create your own personalized UI that will fit your next personal or commercial project. 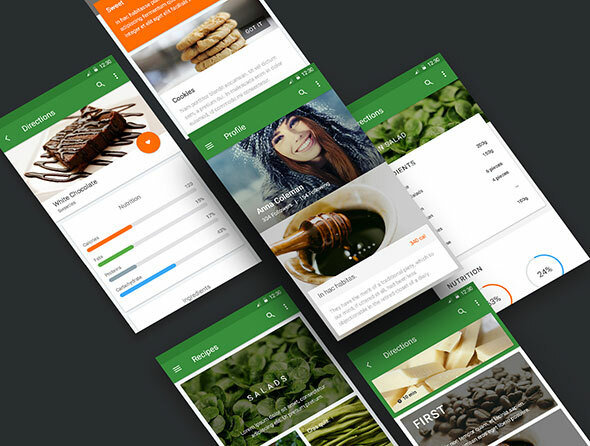 This is an amazing organized and retina-ready set of premium components and templates perfect for a cooking app. 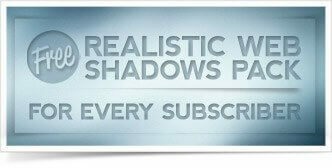 It is available with over 100 UI elements and 50 templates. It works with Adobe CS6+ and Sketch. It’s organized so you can easily find any elements you need and it has a very clean and stylish look where you can insert big images and text. This is a great free UI kit with 8 smart objects such as profile, feed, photos, notifications, and much more. 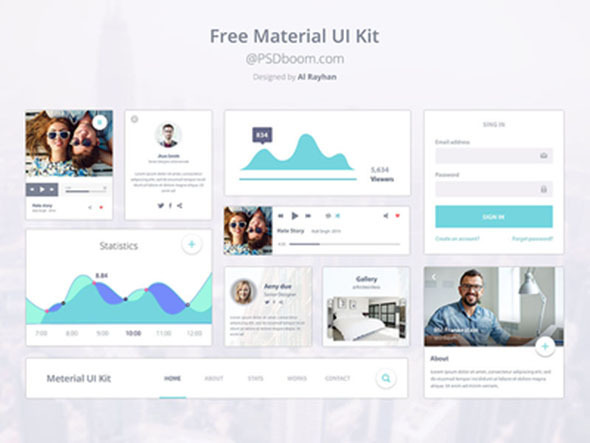 This is a great option if you’re looking for a free UI kit that you can easily customize and use for your own ideas. 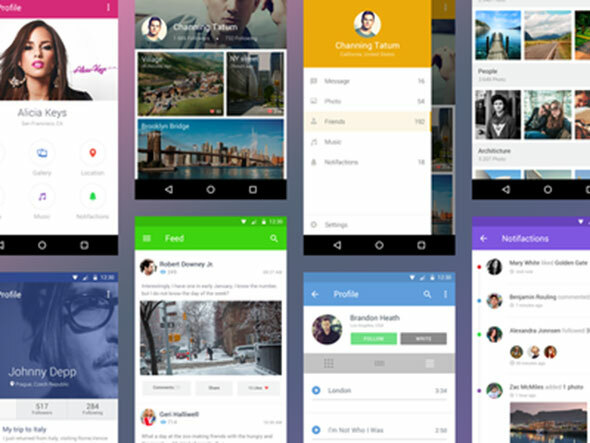 This is an excellent PSD template for Material Design apps designed by Konstantin Karpov. You can download the free PSD file and customize its elements. Station Interactive is a concept design which envisions how a radio or multimedia company can use different methods to interact and engage with clients. The following tools were used in creating this element: Adobe Photoshop CS6 and Adobe Illustrator CS6. This design includes a modern look, bold colors and catchy backgrounds. Download the free file and keep it for further use. 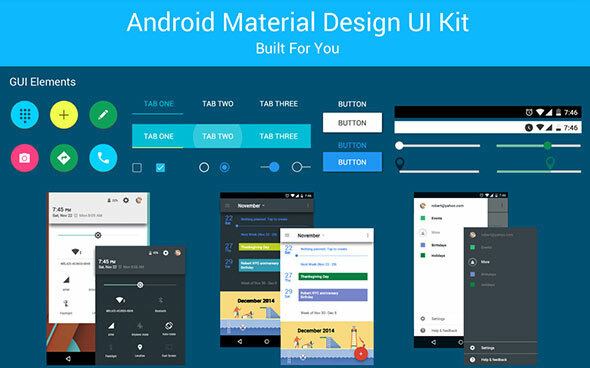 This is a small, but useful set of material design components. You can use these UI elements on your web page design, or on your user interface design of a mobile application. Don’t worry if you don’t have any ideas on how to use this right now, just download the freebie and customize it to suit your next idea. This UI kit comes with many features like profile, music player, statistics, graph, button, navigation menu, and much more. We strongly recommend this because it has a very clean and minimal look with blue accents. It comes as a PSD file. 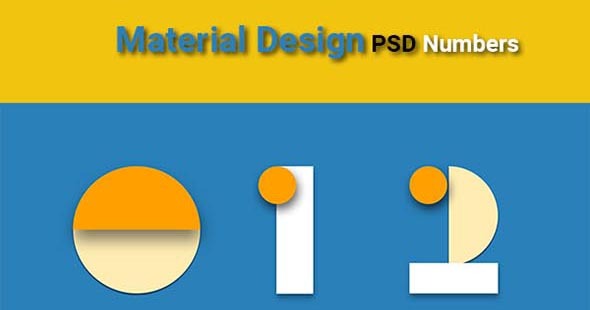 This free material design contains 10 PSD numbers inspired by Google Material Design. You can rapidly change its color and size. This is a great example of material-inspired designs and the bold shapes used for this one create such a unique, catchy look. This sleek meteor material wallpaper was created following Material Design guideline by Google. It has a very strong composition with saturated colors and angled lines. 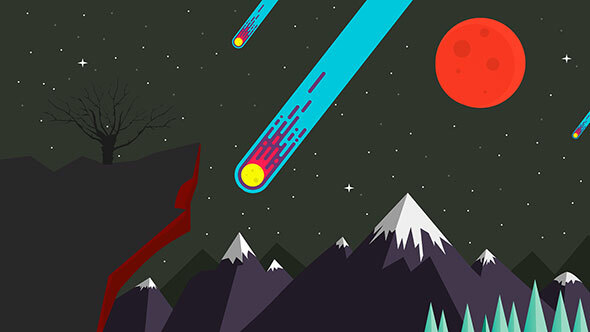 You can download this illustration and transform it into your next wallpaper. This is a small set of basic pieces consistent with the guidelines of Material Design. It includes some photos from Mad Men show, which you will appreciate. 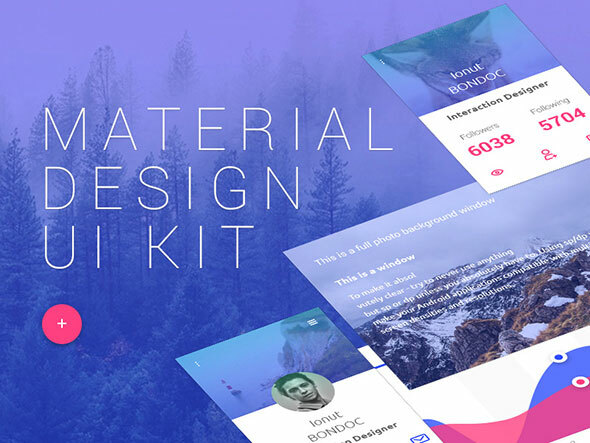 This UI kit is a great example of how easy it is to create nice elements using Material Design, even though you’re just experimenting with it for the first time. 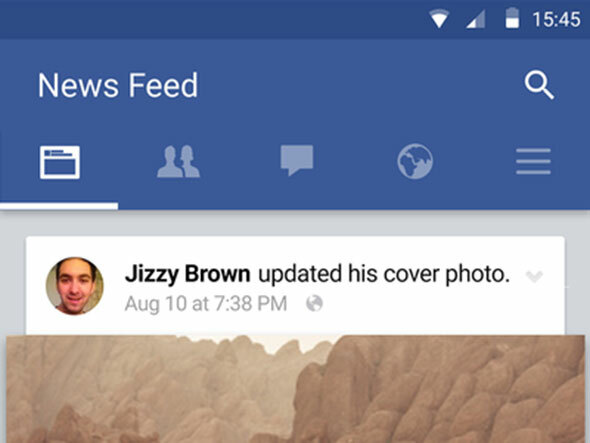 This is an attempt to re-designed Facebook using Android’s Material Design philosophy. By combining the swipeable tabs into the action bar it will become easier to understand how everything slides underneath it. This is an ultimate template of icon also designed in Material style. It includes some great features that allow you to see your icons live. 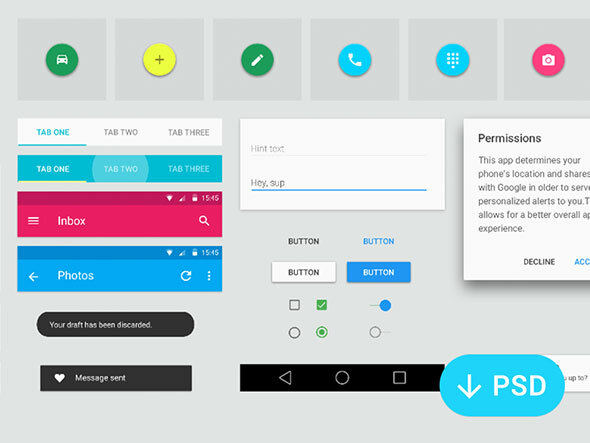 It includes a guideline grid, material shapes for awesome icons and Android screens. In the end, your work will be sliced in all resolutions. This UI kit includes many useful elements like Profile, music player, statistics, graph, button, navigation menu, etc. You can use this kit on your website or app design. 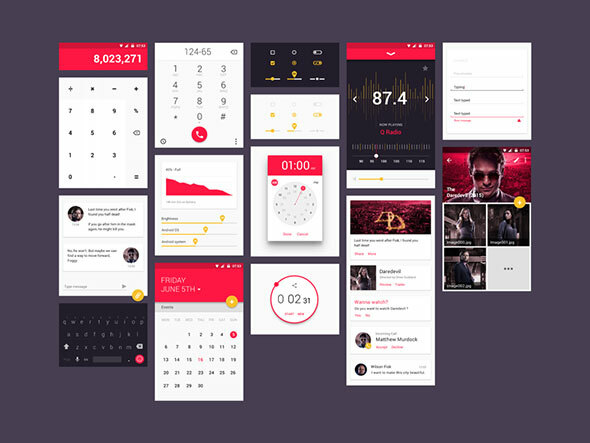 This UI kit was designed based on Google Material Design and you can download and tweak it to fulfill your desires. This is a high-quality PSD with a clean and beautiful layout. It is an incredible resource for design startups and professionals. It also comes with a rich set of UI elements. This entire design was inspired by the clean look of Android Lollipop and it includes buttons, icons and more! 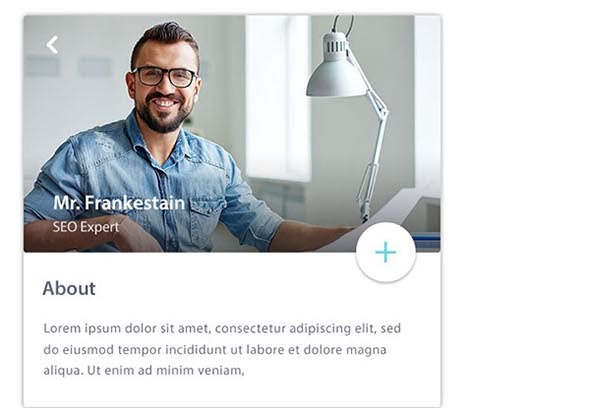 This free Material Design UI kit works in Photoshop CS6+ and is a great help to start your own web project from scratch. It includes a free font family and customizable vector shapes. This design keeps the structure and simplicity of Google Material guidelines and it 100% customizable so you can use it in your next projects. Here’s a pack of 435 icons in Material Design. These are all created by Google, the designer Benjamin Schmidt just bundled them together. The icons are available as separate SVG files and a Sketch file with all icons. We strongly recommend keeping this huge pack close because you may find everything you need in it. Here’s a useful PSD template providing grids for designing Android icons. The free PSD was released by Jiangping Hsu. Download this freebie if you plan on creating your own Android icons from scratch that you can customize as you please. 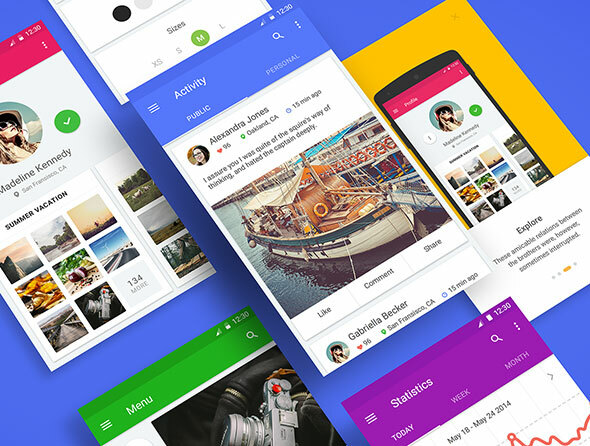 Ivan Bjelajac designed this Android material design, UI Kit. All elements included in this kit are consistent with the guidelines of Material Design. 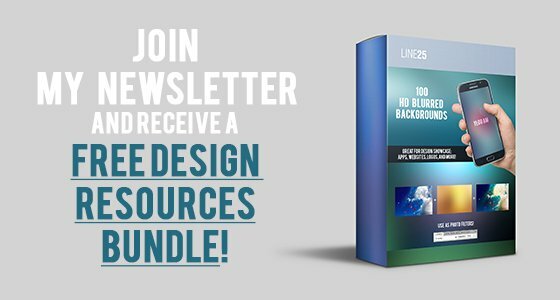 You can download this awesome kit and keep it in your design inventory so you can use it to bring your next ideas to life. 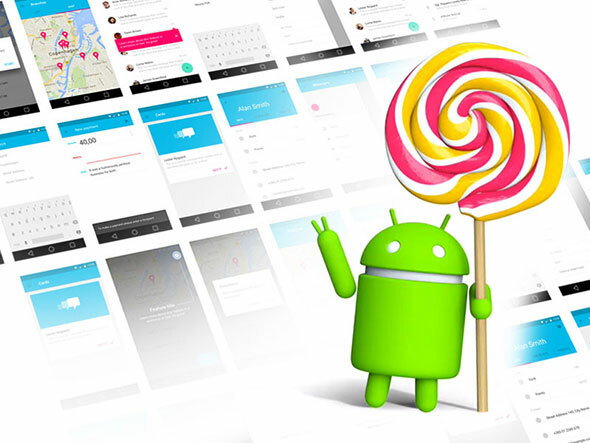 This Android Lollipop UI Kit is a free resource that you will love. Moreover, every element, feature, and form can be fully customized. 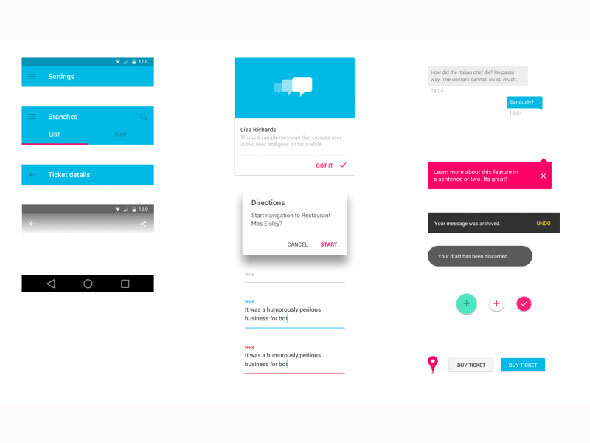 This is one of the most complete UI kits based on Google Material guidelines. It was created by Ivan Bjelajac and you can download and keep it for further use. The highlight is Everyone is Free! Such a great collection of free PSD elements. Thanks for it dude. User Interface (UI) plays a significant role in engaging the target audience. If your website is full of quality information, but UI is not impressive, it means you are missing something important thing in your website design. All these free PSD elements are too important for me. I have bookmarked this post and time to time I could use these PSD elements for my projects. Thanks for collecting all these for us.